The Virginia Lakes Basin offers outdoor recreationists a chance to camp on secluded alpine lake shores, fish in abundant emerald waters, and hike through breathtaking Toiyabe National Forest. Our scenic resort is located on the beautiful Virginia Lakes. We offer fishing, hiking, camping and cabin rentals. Explore one of the ten lakes in the Virginia Lakes Basin. Camp along the pristine shores of Trumbull Lake. Anglers head to Little Virginia, Big Virginia, and Trumbull lakes for the best chance at Rainbow Trout. The Virginia Lakes Basin is home to a cluster of alpine lakes including Trumbull Lake, Red Lake, Blue Lake, Big Virginia Lake, Little Virginia Lake, Cooney Lake, Moat Lake, and the Frog Lakes. They are all located in the Toiyabe National Forest. Visitors come for the spectacular alpine scenery, as well as abundant fishing, hiking and camping. 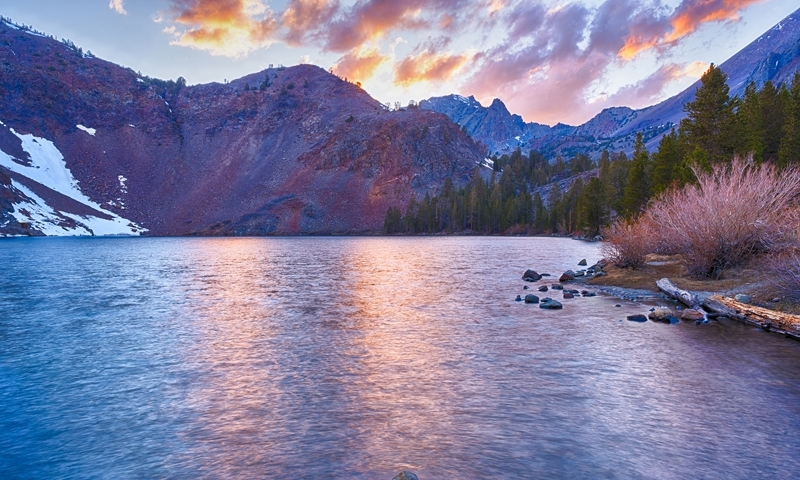 Access the Virginia Lakes area from Mammoth Lakes by heading north on US – 395 for roughly 38 miles. Turn left onto Virginia Lakes Road and follow for six miles until you reach the recreation area. There is a campground near Trumbull lake. Most of the 45 sites are situated in the shade under lodgepole pine trees. Amenities include vault toilets, and drinking water. Fees are $17.00 per single campsite per night. Half of the sites are available on a first-come first-served basis, while the remaining half must be reserved in advance. The campground is generally open from early June until October 15th. One of the favorite hikes in this area is a tour through the Virginia Lakes Basin. The hike runs about 6.6 miles, and has an elevation gain of 1,260 feet. The trail winds past brilliant emerald lakes and boasts views of Dunderberg Peak and Black Mountain. Fisherman have the opportunity to explore ten alpine lakes, most host brook and brown trout, along with aerially stocked rainbow trout. For your best chance at a fish, Little Virginia, Big Virginia, and Trumbull lakes are stocked weekly with rainbows. For your chance to catch an elusive golden trout, head to moat lake.